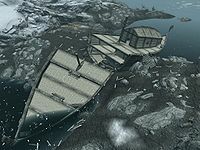 The Wreck of The Pride of Tel Vos is a shipwreck on a small island to the east of Winterhold. It is home to a small band of bandits who have established a camp around the wreck. On the western side of the wreck is a small camp with two bandits standing guard. There is a central campfire with a cooking spit hanging over it. To the west of the campfire are two lean-tos with an unowned bed roll under each of them. To the right is a novice-locked chest and to the left a tanning rack. On the other side of the campfire is a rack holding five salmon. On the eastern side of the wreck is a small island with a second campfire with some crates and barrels nearby. The ship itself is split in two, with a flight of stairs on the eastern side of the large piece leading up to the cabin, where a Bandit Chief lives. There are several barrels and crates around the room, along with an unlocked chest with a bear trap set directly in front of it and an unowned bed roll on the floor to the right. Against the wall is a table with a random magicka potion and several empty wine bottles around it. There are stairs leading down to the mid-deck which is partially flooded with several crates and a Nordic barnacle cluster on the floor. The lowest deck can only be reached from outside where the ship's hull has separated. Here you can find a second Nordic barnacle cluster and at the waterline you can find a waterlogged chest containing the quest item Lymdrenn Tenvanni's Journal. There is nothing of interest on the southern part of the ship. A search of both sides of the island that the camps are on will locate some spiky grass, two iron ore veins, one silver ore vein, and one corundum ore vein. During a random conversation with a Windhelm guard, the wreck is referred to as "The Eye of Talos". The map marker is still added correctly, however. The ship is named after Tel Vos, a Telvanni settlement in Morrowind. There is an island to the southeast of the island with the eastern camp that has two spiky grass, one mountain flower, a mammoth rib cage, and a snowy sabre cat. Also on this island is a log, and underneath this log's southern end is a copy of the Heavy Armor skill book Chimarvamidium and a leveled piece of enchanted armor. This page was last modified on 26 December 2015, at 15:03.